The Commonwealth of the Bahamas is an archipelago of over 700 islands, rocks, and cays located in the northeastern Caribbean, southeast of the US state of Florida and northeast of Cuba. The population of the country currently totals more than 350,000, with the majority of people living in the capital Nassau on New Providence island. 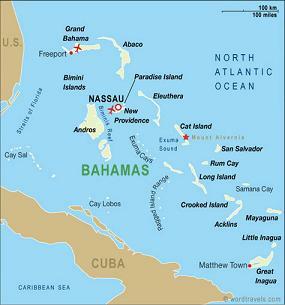 As is the case in other English-speaking Caribbean nations, the majority of people in The Bahamas speak an English-based Creole, referred to by linguists as Bahamian Creole. (Bahamians themselves prefer the term Bahamian Dialect for their unique tonque.) Broadly stated, a creole refers to any language spoken as a native tongue that has developed out of the contact of two or more languages. In the case of Bahamian Creole, the languages involved are English and the myriad African languages spoken by the ancestors of the Bahamian population. Some linguists argue that the language spoken by most Bahamians has been significantly decreolised: that is to say, as the Bahamian population has had more contact with the outside world in recent decades, their language has become more like that of international Standard English. Nonetheless, there remains great diversity in Bahamian speech patterns. Accordingly, the Bahamian population's language patterns vary along what is referred to by linguists as a creole continuum. Those members of the population that speak a variant more like international Standard English are said to speak the acrolect. Those Bahamians speaking the strongest creole variant are said to speak the basilect. Those speaking a variant somewhere between the acrolect and the basilect are said to speak the mesolect. This website aims to be the first centralised clearinghouse on the web for the study Bahamian English issues.